Sony Pictures' thinking behind Spider-Man: Homecoming seems to be "If you can't beat 'em, join 'em." The studio has long held the rights to Spider-Man and made big hits of the Tobey Maguire trilogy of films. But Marvel Studios built an even bigger success of The Avengers' "shared universe" of superhero movies, so Sony tried to set up a similar franchise with Andrew Garfield as the web-slinger. But 2014's The Amazing Spider-Man 2 misfired so badly, the studio gave up and made a deal for a second reboot within the Marvel Cinematic Universe. Last year's Captain America: Civil War gave Tom Holland's Spidey a movie star's introduction, and now he takes center stage with the joyful if somewhat overstuffed Homecoming. 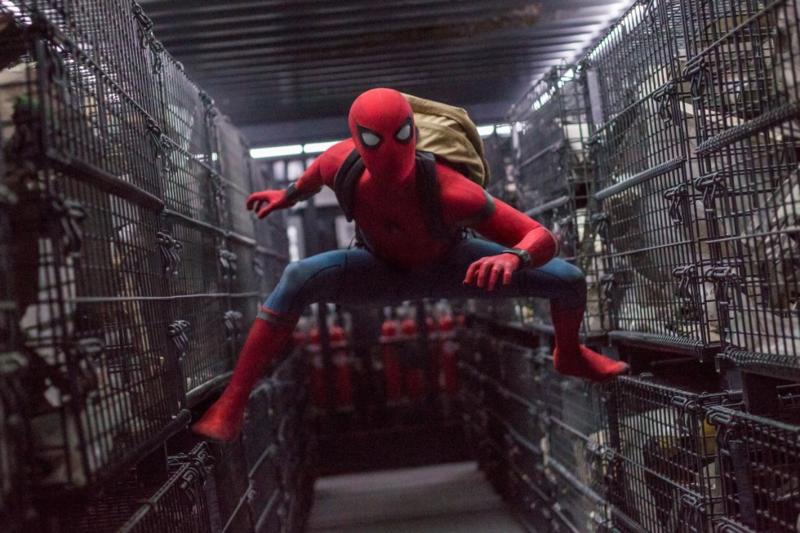 Embracing the character's origins as a high schooler, Homecoming delivers so many jokes, Easter eggs and bits of physical humor that it probably qualifies as a comedy with action scenes, not an action movie with comic relief. Fortunately director Jon Watts keeps up the pace and balances the irreverent tone with respect for the classic character. Early scenes show Peter's perspective on his Civil War adventure through his wide-eyed video diary. In the aftermath, he aspired to become a full-fledged member of the Avengers and claims to be an intern for Tony "Iron Man" Stark (Robert Downey Jr.). While waiting for Stark's right-hand man Happy Hogan (Jon Favreau) to return his calls, Peter impatiently attends classes as a sophomore at Midtown Science and Technology High School. Homecoming's villain has a comparable perspective as an outsider frustrated with his status. We meet Adrian Toomes (Michael Keaton) as a New York salvage contractor planning to clean up after the Avengers' alien invasion. Shut out of the job by a shadowy agency, Toomes starts a new career hijacking, fencing and building alien weapons and other black market technology. Keaton brings gusto to speeches expressing his resentment of the rigged system and elite One-Percenters like Tony Stark: "If you can't join 'em, beat 'em" could be his motto. Toomes takes the nickname "The Vulture" for his winged flight suit, and Peter takes it on himself to stop his crew, even though Tony and Happy try to warn him that it's too dangerous. Homecoming builds to spectacular set pieces at the Washington Monument and the Staten Island Ferry. Homecoming assumes the audience already knows the basics of Spider-Man's origin and doesn't dwell on his guilt over the death of his Uncle Ben (who goes unmentioned) or his persecution by the Daily Bugle. Instead the film captures the rush of playing superhero, including a peppy montage of Spider-Man's good deeds set to the Ramones (also natives of Queens). Holland's performance seems to flourish under this less-angsty approach, emphasizing his overeagerness to prove himself and puppy-dog need for approval. He also engagingly bounces off the young, diverse ensemble, including Jacob Batalon as his wisecracking best pal, Zendaya as a deadpan academic teammate and Laura Harrier as his not-so-secret crush Liz. A plot point includes Stark giving Peter his famous costume, which includes Iron Man-like high-tech features, even a talking, Siri-like A.I. (voiced by Hulk's Jennifer Connelly). Peter's struggle to master the suit's capabilities has metaphorical value it's like he's trying to run before he can walk but is nearly a bridge too far. Peter interacts with his classmates, criminals, celebrity heroes, his Aunt May (Marissa Tomei) does he really need to banter with his clothes, too? Dense with references to both the MCU movies and Spider-Man comic book lore, Homecoming's light touch seems almost miraculous. In a way, it brings the Marvel movies full circle. Director Sam Raimi's first Spider-Man films, despite their tragic elements, proved frequently bright, grounded and willing to laugh at themselves inadvertently making the template for Iron Man and the MCU a few years later. Where failed movie franchises have been grim, convoluted and self-important, Homecoming soars by offering a friendly neighborhood Spider-Man. Spider-Man: Homecoming. 4 stars. Directed by Jon Watts. Stars Tom Holland, Michael Keaton. Rated PG-13. Opens July 7. At area theaters. For analysis of Spider-Man's origins and more of the great comic book stories of yesterday and today, listen to the Comics Canon podcast, hosted by Curt Holman and Kevin Moreau and presented with the support of Creative Loafing.